The most important thing you need to remember when it comes to garage door springs is that you must have them installed and repaired by a professional. Our pricing for material, taxes, and labor starts at $199. Pricing can vary depending on your door’s make and model. We carry the nine most popular door spring companies to ensure quickest repair service possible. Larger springs needed for carriage wood doors are generally a bit more expensive because of their non-standard three-inch size. They usually cost between $20-$100 more than traditional steel springs as they have to be custom ordered. Garage Door Aurora will always provide you with a written quote before ordering your new springs. 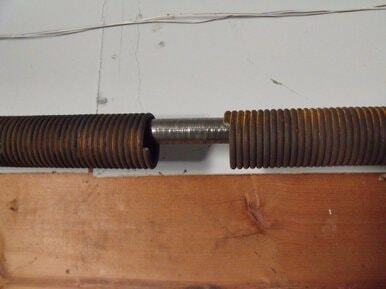 WHAT TO EXPECT WHEN REPLACING GARAGE DOOR SPRINGS? CAN I DO IT MYSELF? Replacing door springs can be very dangerous if you’re not a skilled professional. For this reason, we do not sell garage torsion springs to the general public. Installing the wrong type of spring can add unnecessary wear and tear on your opener. There are also various steps involved with making sure they are properly installed as well as counterbalancing your door. The Garage Door Service Techs are trained professionals and have done hundreds of thousands of spring repairs and although we appreciate our customer’s need to understand how springs function, the last thing we want is for someone to get injured. Let us explain the dangers and details of Garage Door Springs so that you can make the best decision for you and your family. Why do garage door springs need to be serviced by a trained professional? One word – SAFETY! For most Americans, a door is the largest moving object in the home. They are both large and extremely heavy. This means that not only are they incredibly difficult to lift, but when installed incorrectly they can come crashing down with a massive deadly force. The garage door springs that help the doors open are under extreme pressure and can release enough power to severely injure or even kill someone. Specific tools and training are needed when dealing with these springs. There are plenty of other jobs around your place that are perfect for the weekend warrior, but installing new garage door springs is not one of them. You want them installed correctly, functioning safely and smoothly, and you want it done right the first time. Let 1st Choice GDS replace your springs quickly and safely today.